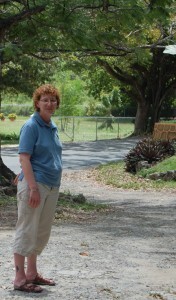 Deb and I took a self guided tour of the St. George Botanical Gardens today. I’ve been there a number of times as that is where Mango Melee is held annually – but I’ve never actually toured the gardens. They are extensive. 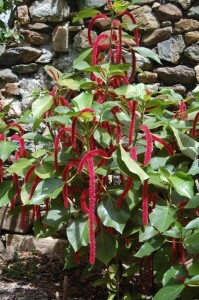 A chenile plant in Laura’s Garden. Themed with red flowering plants. 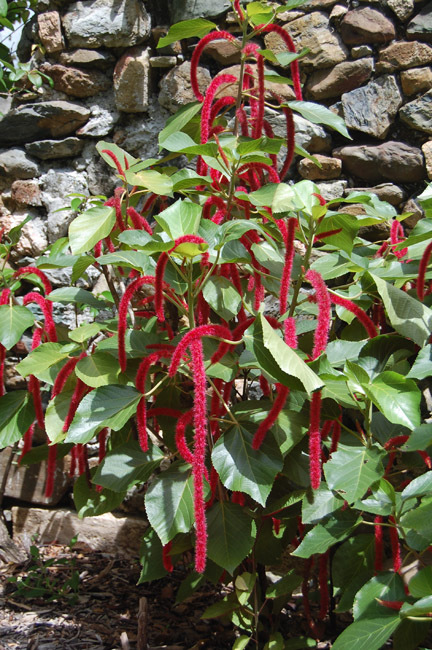 I’ve only ever seen chenile plants as hot-house house plants. Next stop – the Blacksmith’s cottage. There was, apparently a big earthquake in the mid – later 1800’s that destroyed alot of buildings on the estate. This particular building was rebuilt after that earthquake. However, I don’t know how the home-made lime, coral rock and possibly molasses would actually hold up to any of known building code/earthquake zone standards…. 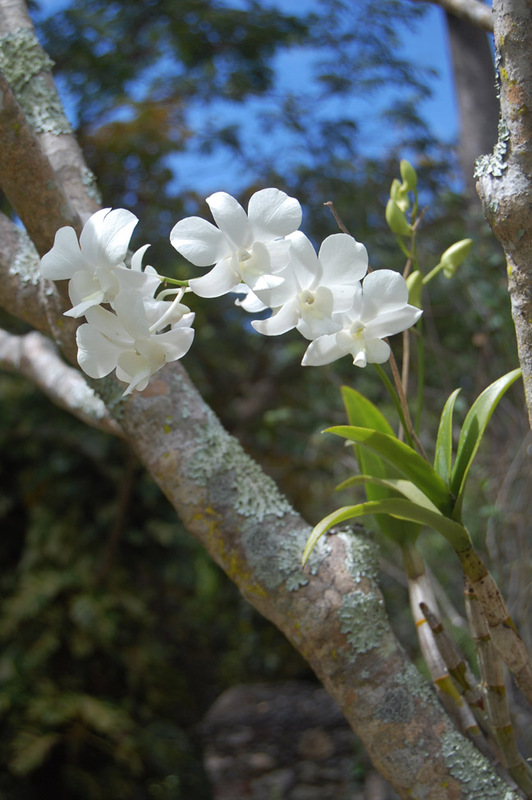 This was a beautiful and fragrant orchid growing on a tree. It’s roots were well seated on the trunk of the tree – almost hard to tell from the actual tree it was growing on. 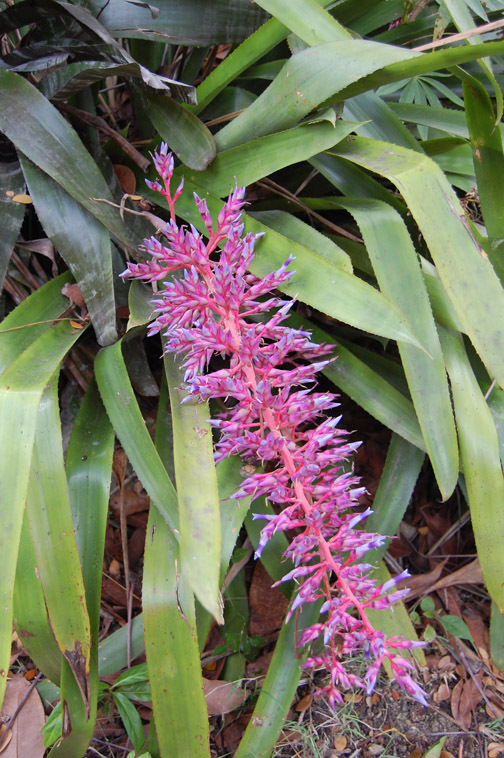 This was an unknown plant – looked like a succulent? This is not a great time of year for a good display of flowers at the Botanical Gardens. It’s been pretty dry. They do have some amazing plants. An African Almond Tree. The hulls on the ground are enormous. There’s the canon-ball fruit tree, breadfruit, Tamarind, sausage tree, a huge fiddle leaf fig tree. They have a palm tree grove that is amazing with it’s variety. The ruins are extensive. They have a flume (for moving water for various reasons), the water wheel remnants, lots of evidence of living quarters – with overseers and manager’s homes still intact. They have a great display of Taino Indian artifacts. 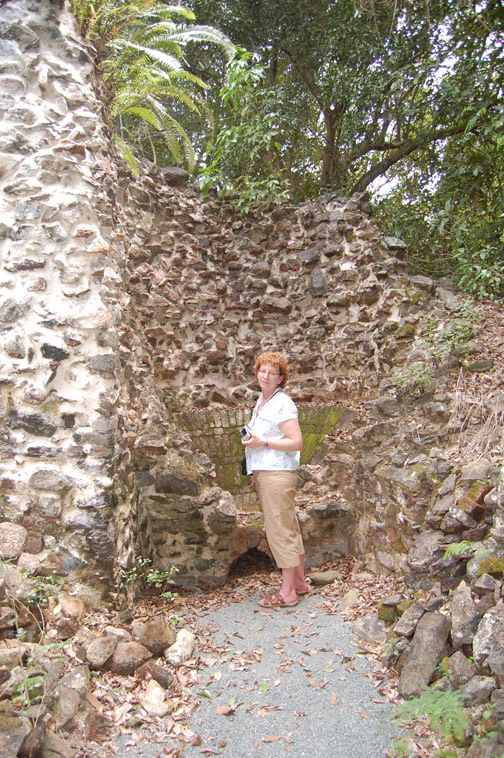 They have a well preserved lime kiln – Deb is standing in front of it here. 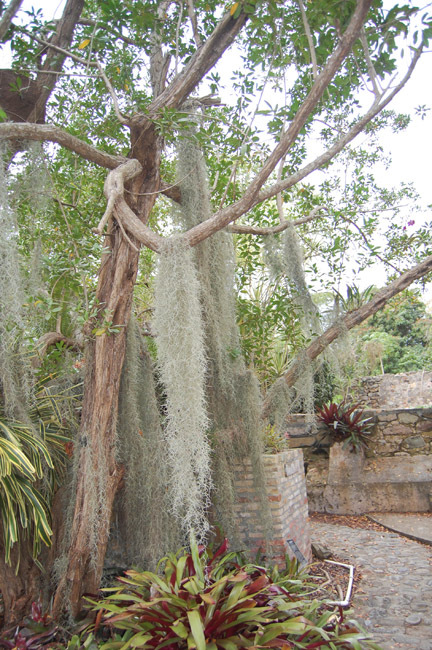 This final picture is of some elegant Spanish moss. Beautiful.